Bad news, Game of Thrones fans. It looks like you're going to have to wait quite a bit longer to see the final season of the beloved HBO fantasy series. According to Sophie Turner, who stars as Sansa Stark on the show, Game of Thrones Season 8 won't air until 2019. Here's what she had to say about it in a recent interview. "Yeah, I'm really excited. Game of Thrones comes out in 2019. Dark Phoenix is in November. Then I have a couple indie movies coming out. I'm a producer on my next movie (Girl Who Fell From the Sky). So I'm really excited about the future." Given the excitement surrounding Game of Thrones season 8, which will conclude the series, it's likely to frustrate many fans that it will be well over a year before new episodes air. Then again, HBO is putting a lot into these final six episodes, so it may well be worth the wait. Sophie Turner also talked a bit about how her character is going to have a tricky road to navigate next season. "It's going to be tricky for her, because at the end of last season, she felt that she had everything set up. She had her family back together. They were in control of the North again. This season, there's a new threat, and all of a sudden she finds herself somewhat back in the deep end. And without Littlefinger, it's a test for her of whether she can get through it. It's a big challenge for her, without this master manipulator having her back. This season is more a passionate fight for her than a political, manipulative kind of fight." Even though Game of Thrones season 8 will only consist of six episodes, the episodes will be longer than normal, so it will basically be like getting six Game of Thrones movies, come 2019. 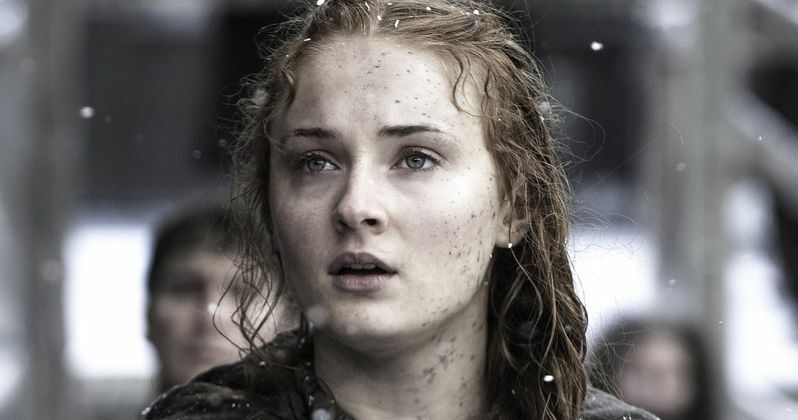 Sophie Turner also says they probably have about "six or seven months left" of filming. The actress also says there's a strong awareness from the cast that this is the final season of Game of Thrones. "There definitely is. When we all had the read-through for the final season, it was very, very emotional. For the first time in Thrones history, we had everyone there. All of the Americans wanted to come over. Every single cast member was pretty much there. We're all kind of feeling the end of it coming. We're all staying in town a little longer, going out for more meals, trying to get together more. We're all trying not to take it for granted any more." It's still very unclear what will transpire in the final season of Game of Thrones, but Jason Momoa, who paid a visit to the set recently, says, "It's going to be the greatest thing that's ever aired on TV. It's going to be unbelievable." Variety didn't reveal a premiere date for Game of Thrones season 8 in their interview with Sophie Turner, but HBO will likely wait a while to reveal that, since the show won't be coming back for quite some time.